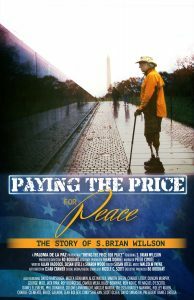 Paying the Price for Peace is a feature-length documentary starring: S. Brian Willson, Dan Ellsberg, Ed Asner, Martin Sheen, Blase Bonpane, Colonel Ann Wright, Ron Kovic, Medea Benjamin, Alice Walker, Bruce Gagnon, & David Swanson, and other current outspoken anti-war veterans of the US Wars including Iraq and Afghanistan. Thanks for your patience as we mail out the DVD’s a batch at a time by one dedicated person. Priority will be given to the hundreds of people who contributed to Indiegogo Campaigns in 2012 and 2015, and whom have already submitted pre-orders. We are in the process of promoting this important film and need assistance with marketing and distribution. Help us get the word out by donating for future screenings and promotional costs.